Just a day after the Virginia Tech shooting, RIT student Jonathan Hackenburg (pictured at right, probably with a severe case of sleep deprivation) was taken into custody for possession of assault weapons. The whole thing came about because Rodney White — the facilities supervisor at the hotel who is being praised in the media and in letters to RIT students and alumni for his “quick response and diligence” — allegedly heard the sound of a firearm being racked. Students give up many of their freedoms when on campus: to privacy, to bear arms, to be free of unreasonable search and seizure, and occasionally to free speech. Those are the big ones that I’ve complained about in the past, although this is a different matter altogether. As much as an individual’s rights may be trampled by a University, this kid wasn’t too bright. I question the intelligence of rebuilding or cleaning your guns in your dorm room in close proximity to the events at Virginia Tech. I further question the intelligence of doing it in a dorm located within a hotel (outside of the Institute’s private property) that is staffed by people not on the college staff (who aren’t bound by the college’s private Judicial Code, but by laws of the county/state). None of the protections of being on privately owned college campus are going to apply. What did he think was going to happen? This is the American made Stag Arms STAG-15 (model 1, for the picky). These are routinely issued to SWAT teams across the country and are part of many people’s “homeland defense” collections, for the day when terrorists attempt to take over their home. Not too friendly looking, is it? Police found one of these and a Romanian AR-15 style rifle in Jonathan’s room. He must like his AR-15′s. Both probably chamber a 5.56mm NATO round and are considered assault rifles. The police also found a few 30-round magazines and two boxes of ammunition in his car. His New Jersey firearms permit aside (and the fact that all weapons weren’t loaded), the high capacity magazines are illegal there and in New York. All firearms are outlawed on RIT property, although the Inn may or may not be considered an extension of that property. 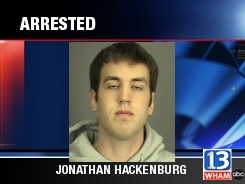 Monroe County Sheriff Patrick O’Flynn said Hackenburg is a gun hobbyist and spends time rebuilding the weapons. “There was no threat. There was no indication of prior use in the area or did he make any threats he was going to use them,” O’Flynn said. A pity, really. The kid is going to face some stiff penalties for possession no matter his intentions or hobby. Also unfortunately is that — considering recent events — I don’t think it’ll be possible for him to get a fair hearing. He’s been suspended from RIT, but he’ll undoubtably be expelled. That’s small potatoes, considering that the criminal charges will follow him for the rest of his life. Is That a Police Officer on the Front Steps? According to the RIT press release, the hotel was a donation to RIT. For the purposes of the RIT Campus Safety annual report (PDF), they consider it “Non-campus site”. I recall from my undergrad time that reports included a small remnant of the former downtown campus that RIT still owned. They sold off the property, and it was no longer included in the reports. Paul: So the building’s omission from the reports would indicate that it’s not part of the campus. He’s on his own, then. Scared: I don’t know him, but people are quick to judge gun aficionados. He belonged to the Rochester Brooks Gun Club and always had a safe history there. Yes he broke the law, but I think his case is being blown out of proportion. In any event, he made bail on on Wednesday afternoon (either $15,000 cash or a $30,000 bond). He’ll end up doing time. USC 18 §3581 says that a Class D felony is punishable by up to six years in prison; I’m sure NYS penal code is similar, although I doubt the ATF will find him in violation of trafficking laws. Henrietta Road is included in the Non-Campus Site category. Paul: Okay. I imagine that despite being a non-campus site, all the standard RIT Rules & Responsibilities apply? I would assume so, since it is used for student housing and all.